A backfill entry, pulling out the narrative from the photos in my Morocco via Madrid – April/May 2010 Flickr set (which I see I must now learn to call an ‘album’). Phil took some beautiful photos – as he says, I guess there’s something daft about only taking black and white photos on a trip called “Colours of Morocco”. So, four years late, here are my photos and notes on me, Phil, Madrid, Morocco from April/May 2010, my having escaped from ash cloud internment in Hong Kong 48 hours earlier. We explored Madrid using DK’s Top 10 Madrid and our Moroccan adventures came courtesy of Intrepid Travel’s Colours of Morocco tour. Failing to find a local breakfast joint, we made like the Madrileños and strolled around Parque del Retiro (map), emerging into the Prado-zone via the Plaza del Parterre. Passing by the museum zone, we walked up the Paseo del Prado to the Banco d’Espana, and strolled on towards Sevilla metro stop, having a late breakfast/elevenses in Quedamos en Hontanares. 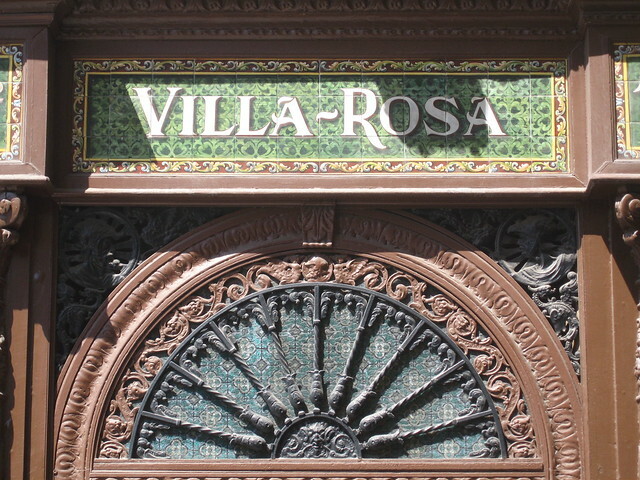 Refreshed, we explored the streets of old Madrid. Our lunchtime beer and tapas, just off the Plaza Mayor, featured patatas bravas, boquerones and beer. Refuelled, we continued strolling as far as the Palacio Real before making tracks back to the hotel. Hasta luego, España; Salaam aleikum, al-Maġrib. EasyJet handled the flights (and the passengers with surplus hand baggage) with aplomb, and we took at taxi to Hôtel Guynemer for the start of our Intrepid: Colours of Morocco tour. 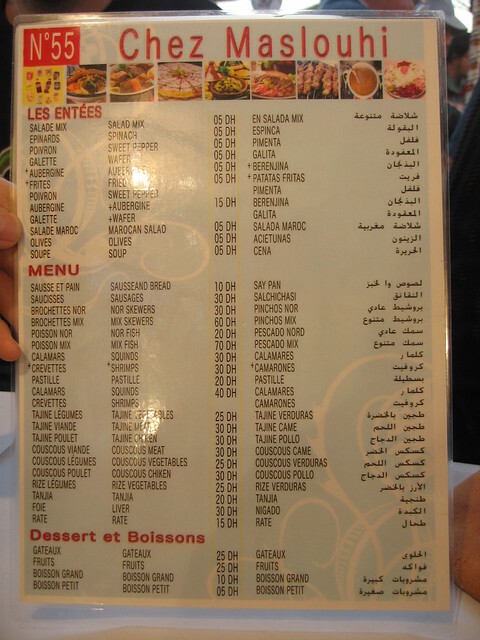 After our welcome briefing and meeting the rest of the group, Mohammed, our local leader, took us to the Restaurant L’Etoile Centrale – very good place to eat: traditional decor and good food. 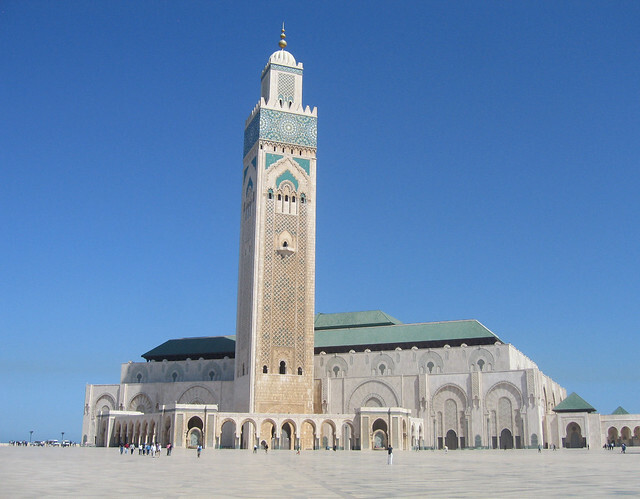 After breakfast in the Hôtel Guynemer, Mohamed loaded us into taxis and sent us off on our DIY tour of the Hassan II Mosque, home to the world’s tallest minaret (210 m). After the mosque, we rose to Mohamed’s challenge to sort out our own taxis back to the hotel, then on to catch the train to Rabat. Leaving our bags at a local restaurant, Mohamed took us from Rabat’s Ville Nouvelle to the Medina (thereby sampling the UNESCO World Heritage Site of Rabat, Modern Capital and Historic City: a Shared Heritage). After an early al fresco lunch on Sandwitch Alam’s cafe roof top, he led us around the medina, into the Kasbah des Oudaïas, culminating in afternoon tea at the inevitable Café Maure. We then had an hour or so to explore under our own steam – we visited the Hassan Tower and the modern Mausoleum of Mohammed V which was followed by a geographically challenged attempt to make our way back to the train station…. After a late evening arrival into Meknès on the train from Rabat, we ate at one of the Rough Guide’s recommended local eateries – Restaurant Marhaba (speciality of the house: roast chicken, as a veggie I opted for the alternative house special: Harira soup, fried buttery potato croquettes and bread, boiled egg optional) – and then slept well at the Hotel Majestic. A UNESCO World Heritage Site triple whammy today: Historic City of Meknès, the Archaeological Site of Volubilis and the Medina of Fez. Armed with a map from Mohamed we had a morning to DIY in Meknès. Skipping the hidden splendours of the Versailles of North Africa, we opted to walk from the Ville Nouvelle into the Medina, where we enjoyed a tranquil exploration of the Mausoleum of Moulay Ismaïl and a mooch around the souq and its surrounding streets. The group reunited in the main square to go for the much vaunted camel burger lunch, and then a quick visit to the Bou Inania Merdersa / Madrasa (المدرسة البوعنانية‎) before loading up into our minibus for the drive to Volubilis. 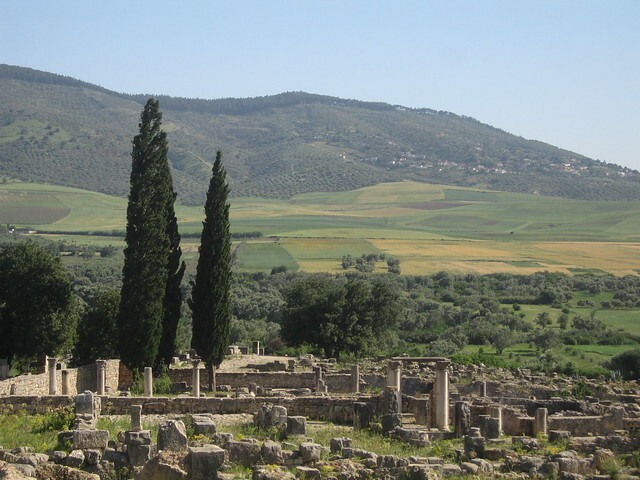 An hour or so’s drive took us through lovely countryside to the Roman ruins at Volubilis where we had an excellent guided tour in the lovely mid-afternoon sun before continuing on through the rural landscapes to majestic Fez, arriving in the late afternoon/early evening. Having checked into the Hotel Olympic we had time to spare for washing, buying and eating beer and chippies before eating out for dinner a few doors down at the Cafe 24/24. We headed out of the Hotel Olympic to find a better value breakfast, and having done a circuit of the central market, settled ourselves at one of the pavement tables outside Crèmerie Skali where we tucked into coffee, honey ‘bread’ and feta ‘bread’, plus freshly made orange juice and melon juice. Very tasty. We had a whole day guided tour of Fès, starting with a minibus ride to the Place des Alaouites to admire the frontage of the Royal Palace before motoring on through the Ville Nouvelle to one edge of the Medina of Fez, aka Fes el Bali (فاس البالي‎). 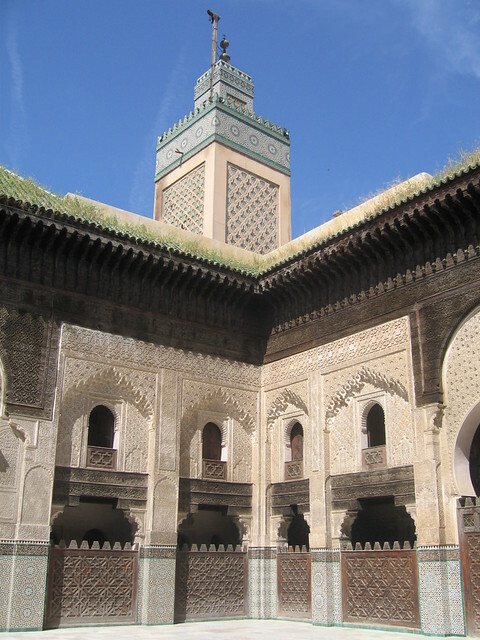 Our walking tour of the medina started at the Bab Boujeloud, followed by the Talâa Kebira and then the Medersa / Madrasa Bou Inania – beautiful, I could have spent longer there. Leaving the Bou Inania Madrasa we were guided around the medina some more before leaving and driving out to the Borj Nord for great views out over Fes el Bali, and then onto the Art Naji ceramic workshops where we had a fascinating tour and watched the craftsmen at work on the tiles, chipping out the curved designs from the glaze or creating the intricate zellij table tops – plus the mandatory shopping opportunity. 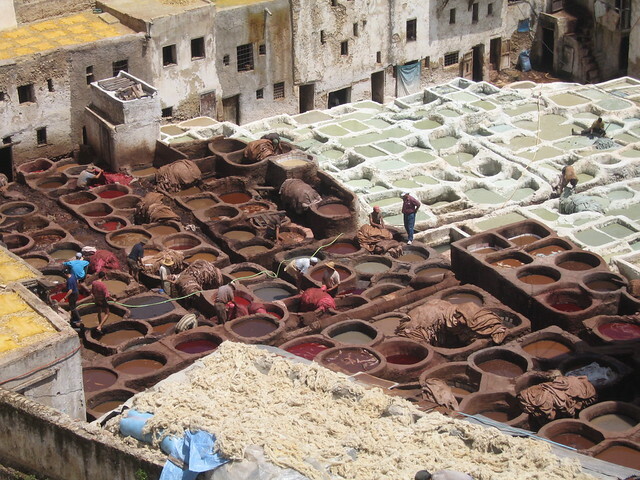 Back in the medina, we wound around the small streets, making our way to the Dyer’s souk where our guide took us to a leather shop with a great view over the tanneries Chouwara. After a local lunch at the lovely Restaurant Famille Berada – great food and a fantastic character as our host – the “guided tour” focused more on the shopping opportunities…. first up a carpet shop in a traditional Fassi fondouk followed by another fondouk – this time unrestored – which housed a weaving business. Lots of beautiful colours, and a chance to get dressed up in a Moroccan headdress/scarf. 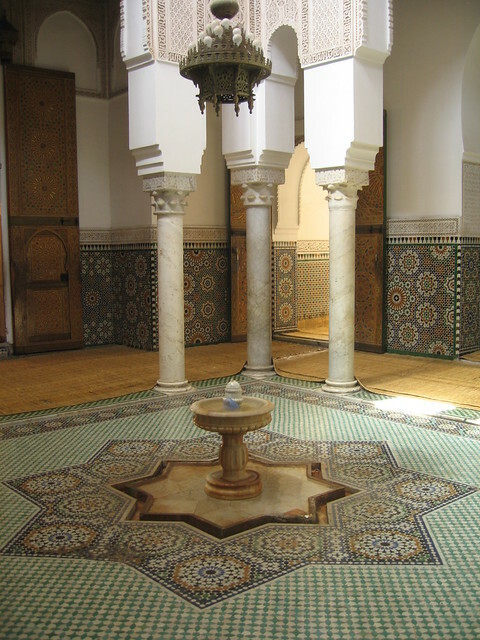 From the fabric fondouks, it was back into the streets and alleyways, via the Mosque and Mausoleum of Sidi Ahmed al-Tijani, the Place el-Nejjarine (Carpenters’ Square), the Nejjarin fountain and fondouk to the Zaouia of Moulay Idriss II and on to our final stops in the metalwork/antiques cellar and the beauty/perfume/herbalist shop. 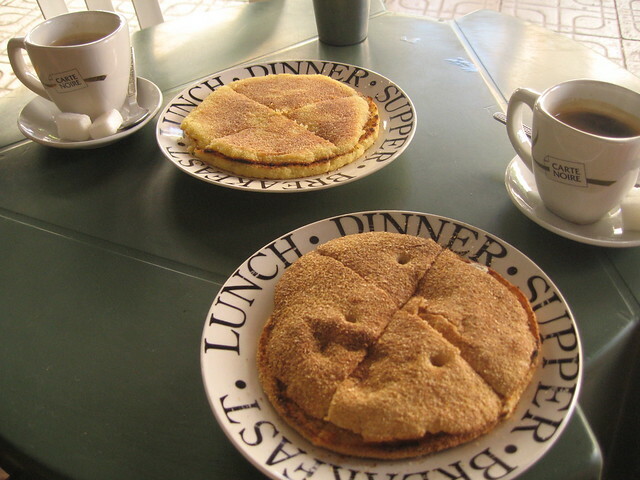 Back to Crèmerie Skali for our final breakfast in Fez before embarking on day 5 of the tour which saw us leave Fez for the cooler climes of the Middle Atlas mountains, stopping mid morning at swanky Swiss-a-like Ifrane (إفران/يفرن‎) for a leg stretch and shortly after in the cedar forests to admire the cheeky Barbary apes. Lunch at Melouia was decidedly meaty…. and the view from the restaurant ‘terrasse’ of the swaying, fly feast carcasses of once local goats wasn’t my favourite … Goat tagine for the boys and Maree; tomato, cucumber and olive salad for the girls. After lunch we motored on towards Midelt, and onwards to our overnight stop at Auberge Jaafar. En route we called in at Kasbah Myriam, a carpet and embroidery workshop run by Franciscan nuns, and as we left, the heavens opened and thunder and lightening began…. which subsequently meant Phil and I opted out of the Berrem village walk. Auberge Jaafar, with its flower filled courtyards, gardens and swimming pool would have been lovely in warmer weather. 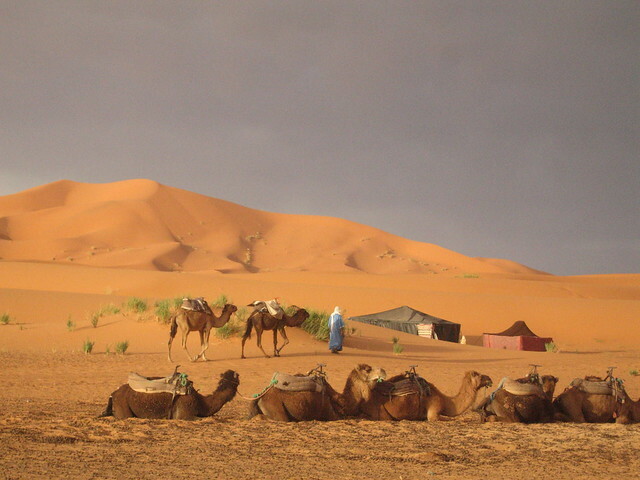 My memories are of being cold and of the awkwardness of the ‘traditional dance’ display…..
Day 6 took us south from Midelt and the Middle Altas to Merzouga and the giant sand dunes of Erg Chebbi. En route we lunched by the beautiful Ziz Gorges and palmerie. Having stocked up with water at Merzouga and bumped for a good hour across the hamada, we reached ‘the desert’ in the late afternoon. Leaving our main bags at a little used auberge, we were loaded up onto camels and rode out to our berber camp at the base of the Erg Chebbi. The sandstorm and rain en route weren’t quite what anyone expected, but when the sun was out, the colours were beautiful and the climb up our ‘local sand dune’ gave us some great views …. of other tourist groups on their camel ride out to the not-so-authentic berber camp (more of an Alton Towers ‘experience’ than an actual opportunity to camp with berber nomads). Day 7 started early, with a pre dawn wake up call from Mohamed so that we could climb back up our local giant sand dune to watch the sun rise. I made do with a lower altitude ridge, and watched the various camp camels being readied for the return trip. Back at Auberge Salama we had a smashing breakfast (but no washing permitted) then it was back across the hamada to Merzouga and the road to Rissani, Erfoud, Tinejdad, Tinerhir (تنغير‎) until we reached our final destination, Todra Gorge. A long day in the minibus. The drive through the Tafilalt (تافيلالت‎) was broken up with stops to admire an ancient looking water irrigation system (Moroccan khettaras are from the same family as the qanāts of Iran and the karez of Turpan), lunch at a roadside restaurant somewhere on the N10 and to buy (expensive) beers just outside Tinerhir. 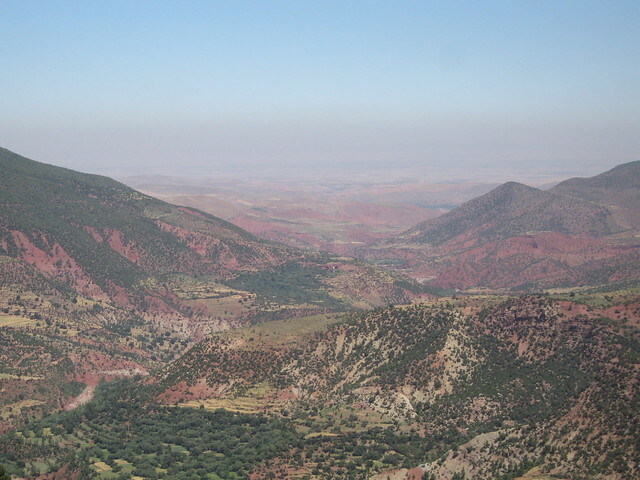 At Tinerhir we turned off the main roads and started winding up towards Todra Gorge, and the High Atlas mountains. Two nights at the Maison d’hote Taborihte was a real treat, although again the weather wasn’t really warm enough to enjoy the pool and sun loungers to the full. We had a whole day based at the Maison d’hote Taborihte, and (all bar Phil) we opted to spend the morning on a half day guided trek through Todra Gorge and up into the mountains, on a circuit that culminated back in the valley for a traditional berber lunch at the Kasbah Restaurant Dar Ahlam…. and then a lazy afternoon back at base. Todra Gorge itself is a bit of a let down – two hotels nestled at the base and big roadworks make it a ‘busy’ rather than tranquil place. Once through the gorge however you’re out in the rocky ranges and dry river valleys of the lower reaches of the High Atlas mountains. Lovely. En route we stopped for mint tea with some real berber nomads, at their high summer camp. Leaving the lovely Maison d’hote Taborihte, we drove back along the Todra valley through the Tinerhir palmeries to the town where we visited Association Ighir, which teaches and employs local handicapped people, selling the crafts they make at the centre, and then on to a leisurely lunch stop at Morocco’s “Hollywood”, Ouarzazate. 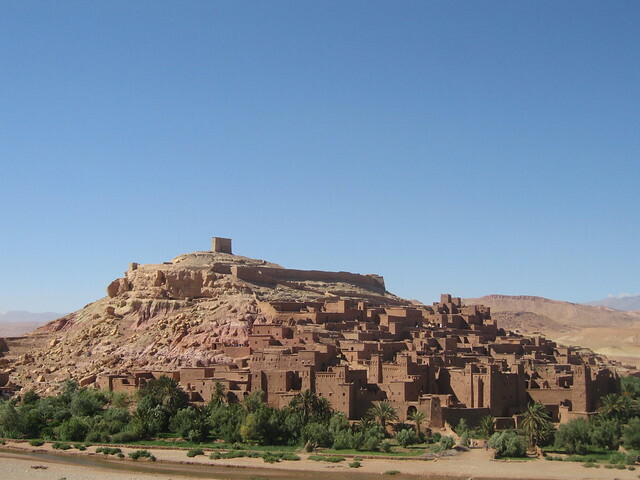 A short drive brought us to the village of Aït Benhaddou, home to another of Morocco’s UNESCO World Heritage Sites, the fantastic fortified ksar of Aït Benhaddou. A definite highlight of the trip for me. The day ended with a cookery demonstration (couscous and tagine, what else?) by the marvellous Mr “Action” Houssain and then a delicious dinner (albeit couscous and tagine!) at our lovely maison d’hôtes, La Fibule d’Or. Up early on day 10, for a smashing breakfast on the roof terrace of La Fibule D’Or, making the most of that marvellous view out over the Mellah river and Aït Benhaddou. Another day of driving, but this time up into the High Atlas mountains and over the Tizi-n-Tichka pass, zig zagging back down and on through villages and farmland climbing back up towards Imlil and the beautiful Toubkal National Park. En route we lunched at the cafe restaurant Ard Assalam – a great location, but the food wasn’t nearly as good as the view from the terrace. Late April/May was a perfect time to visit the High Atlas mountains… beautifully green with wild flower jewels in the fields. 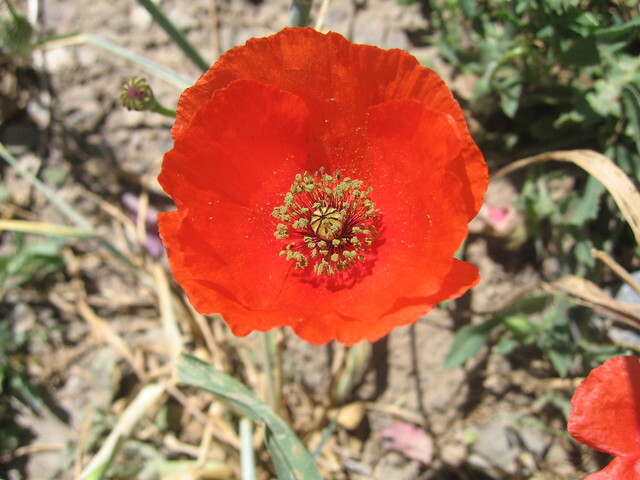 The photos of the poppies in particular do not do justice to the scenery – bucolic bliss. 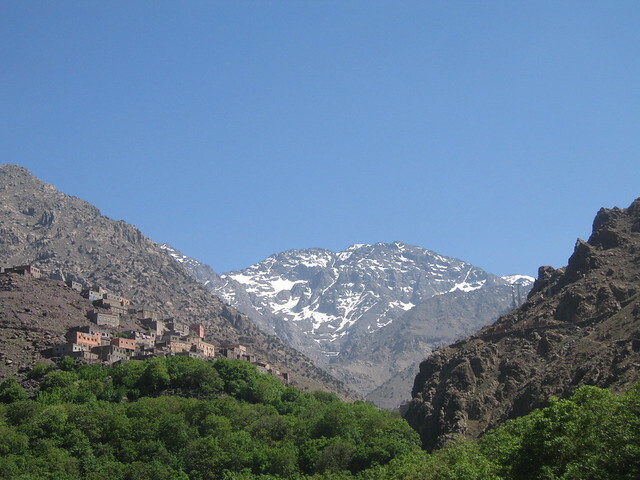 The road stops at Imlil, and lovely 45 minute walk up into the mountains brought us to the hill top village of Aremd, where we spent two nights in the simple, friendly family run Gite Atlas Toubkal. A sunny afternoon to stroll around the backstreets of the village with its beautiful views up the valley towards the snow capped peaks, then dinner at the gite. Most of the night and this morning I spent in the loo, courtesy of yesterday’s lunch. So I opted out of the walk up the valley to the shrine of Sidi Chammharouch (2350 m / 7710 ft). After lunch we left Aremd walking back to Imlil where we loaded up into the minibus for a long, long, long day’s drive to Essaouira via Marrakesh, swopping the lovely mountains of the High Atlas for the fresh sea air of the coast. It was just the long hot journey in between that was tedious, even with the stop at the women’s cooperative which produces argan oil, and has goats in trees. Hence only 2 photos. 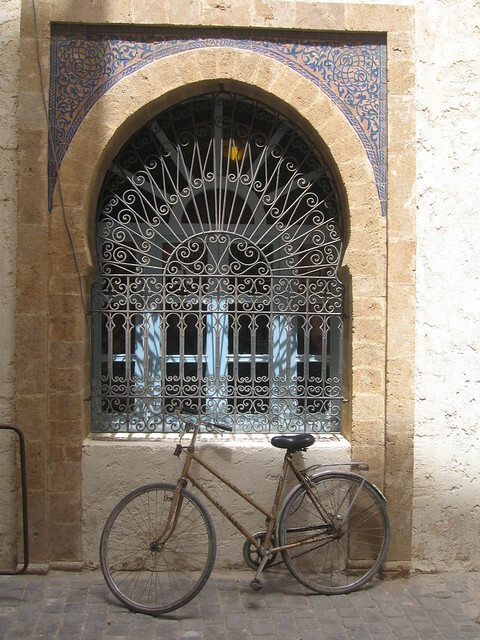 Our Essaouira base was the lovely Riad Dar el Qdima – a tranquil haven just off one of the main streets in the Medina. A cliché, but true! We had a light and airy roof top room, and the Riad was one of the best places we stayed in for the whole trip. I’d go back. We had the whole of day 12 in Essaouira, starting with a guided tour of the old town, taking in the harbour, the kasbah, the medina and the mellah – all before lunch. Left to our own devices for the rest of the day, Phil and I lunched at the delightful La Découverte and then continued to mooch around today’s tick on the UNESCO World Heritage Site list: the Medina of Essaouira (formerly Mogador). We managed to cover a lot of ground whilst avoiding any shopping, and the UK General Election. We did find time for an espresso and ice cream, de riguer at Gelateria Dolce Freddo on Place Prince Moulay el Hassan. For dinner we eventually settled on tasty pizza and giant fruit juice in a trendy-and-empty pizza place next to La Découverte. The veggie/vegan places in the Rough Guide had been deserted and looked too earnest. And by chance we bumped into Gavin, Anna and Thomas en route who were escaping the hustle and bustle of Marrakech. We had more time to mooch around Essaouira on day 13, catching an afternoon Supratours coach to Marrakech. We spent the morning soaking up the sun on the roof terrace and pottering around the medina, lunching at one of the open air cafe restaurants in the Jewellers’ Souk. The journey back towards Marrakech was better than the one out, and having checked into to the tired-looking Hotel du Pacha (warning: Moroccan music!) in Guéliz, Mohamed walked us into the old city, and dinner at one of the food stalls in the Djema el Fna (ساحة جامع الفناء): Chez Maslouhi. Day 14, and our last full day of Intrepid’s Colours of Morocco trip, was free to DIY… so Phil and I headed out along Avenue Mohammed V back towards the Medina of Marrakesh, the last of Morocco’s UNESCO World Heritage Sites that we visited. 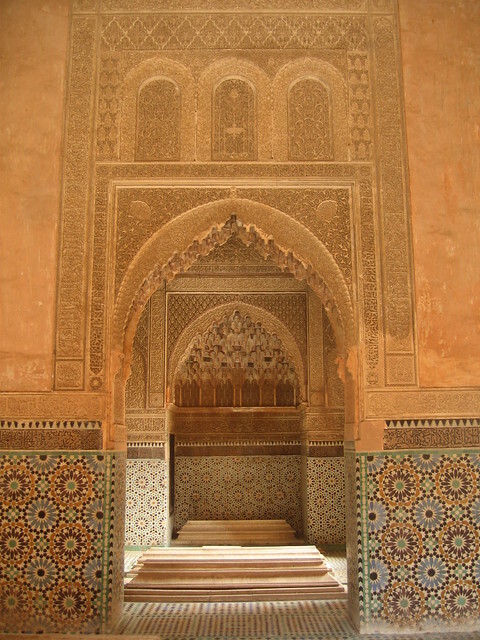 Our first stop were the much-lauded Saadian tombs, but we were rather underwhelmed by that experience. With hindsight I think we were both a bit tired by this stage, and we’d been more impressed by our architecture and the souk experiences elsewhere. Cute cats though. Next, we made our way back to the Djema el Fna and into the souk. Emerging, as planned, at Place de la Kissaria, we decided against visiting any more monuments, and instead explored the streets of the northern medina. Never exactly sure where we were, we had a lovely time! After a late and delightfully leisurely lunch at the Elite Café on Place du 16 novembre back in Guéliz, we walked on to the Majorelle Garden (حديقة ماجوريل‎). Not quite what we’d expected – but a pleasant spot to read for a while, once we’d found a bench. Our final dinner was back in the Djemaa el Fna, followed by beers in the hotel courtyard. We flagged down an early morning taxi on Avenue Mohammed V getting to the smart Menara International Airport well in time for our 8am check in on easyJet flight 8894 which took us back to London Gatwick, then the train back into central London. Home sweet home. So, finally, my Morocco via Madrid – April/May 2010 set is “done” on Flickr, with mini diary entries composed en route. Phew. A long job, particularly getting them (approximately) mapped…. It’s been lovely having Phil uploading his photos too at the same time. You may spot that some of the evening photos have snuck into the next day’s archives….. I forgot to adjust my camera clock at the start of the trip and I can’t be bothered to update all the EXIF data. Sorry! Clearing the digital decks before my next trip…. … “belatedly” in the sense that we got back fine, as scheduled, on 09 May – but I’m only just getting round to updating my Where next? page to relocate the details of Mary and Phil Go Mad in Madrid and Morocco to make space for (eek!!!) this summer’s expedition: Wild Frontiers’ Himalayan Journey from Lhasa to Kashgar….. But back to the background on April/May’s trip to Morocco via Madrid! Photos still to do…. … to soak up some sun, sea, souks, Sahara, summits and ancient sites and ruins in the company of my husband…. yes, our first stab at a Mary-style holiday together. On Intrepid’s Colours of Morocco tour (map), (trip notes). We were going to get the train down – there was an article in the Guardian Travel section a while ago that we both remembered, by The Man in Seat Sixty-One, and the facts / figures / links are all on his website. Basically we should be able to leave London on the Friday afternoon and be in Casablanca for the 6pm group meeting on the Sunday at the start of the trip…. but there are overnight engineering works on the Paris-Madrid route on the Friday/Saturday we’d need to travel. So it’s plan B: easyJet from London Gatwick to Madrid, two nights in Madrid (at the Hotel Agumar) and then easyJet from Madrid to Casablanca. All for a lot less then Royal Air Maroc’s direct flight from London to Casablanca. We’re also using easyJet to fly back from Marrakech. BBC: Dozens die in Morocco minaret collapse: At least 36 people were killed in Morocco when a minaret collapsed at a mosque in the central town of Meknes, officials say. It turns out that there are overnight engineering works on the line from Paris to Madrid on the Friday we need to travel, so our beautiful plan to travel from London to Morocco by train (and ferry) stumbles at the first hurdle. Undaunted, we’ve devised plan B: easyJet from London Gatwick to Madrid and an overnight stay in Madrid (booked into the Hotel Agumar, conveniently close to Atocha train station), which should then get us back on The Man in Seat Sixty-One …‘s (train) track. But it’s never that straight forward…. Renfe and RailEurope both seem to be suggesting that there are no trains from Madrid to Algeciras either! DeutscheBahn looks more hopeful, and if all else fails the easyJet flies from Madrid to Casablanca, and the current pricing is ~ EUR 20 each. For comparison, London to Casablanca with Royal Air Maroc was coming in at ~£450 per person…. Update: We’ve gone for the easyJet option, easily extending our hotel booking one more night, and we’ve just this minute booked our MAD-CAS flights. Sorted! Tempting treks and trainhotel tribulations…. H and I went to the Destinations travel show yesterday, and had a chat with the Mountain Kingdoms team about what trek to do next, given we enjoyed their Annapurna Circuit trip so much. I’m tempted by Everest, not Base Camp in particular (or the prospect of 9000 or so fellow trekkers) but the combination of Nepalese hospitality, fantastic scenery, circular routes and tea house accommodation, and corresponding camera battery recharging opportunities! H and I are both a bit concerned about spending a lot of time over 4,400m – we both noticed the altitude at Thorung Phedi and the following day’s crossing of the Thorung La – and all the Everest treks look like there are a few days up that high. The snag with the Huayhuash trek (apart from flying over all that ocean… ) is that it’s camping… it is not so much the camping itself that puts me off (so long as we don’t get wet, and we’ve got snug kit for the cold nights), it’s not being able to recharge my camera batteries!!! Hey ho…. We also popped in to say Hello to Nat and Jonny at Wild Frontiers, who suggested their High Road to Kashmir (a long time wishlist destination since my Hindu Kush Adventure) and their Lhasa to Kashgar expedition which includes a circumambulation of Mt Kailash and a trek to the Chinese EBC …. OK, neither of them are lengthy treks but those itineraries look awesome….